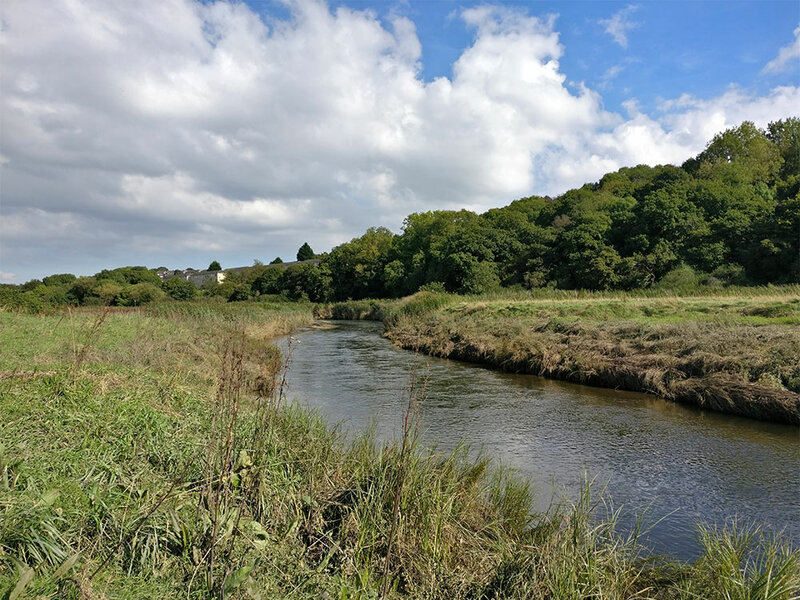 Wentloog Avenue – The Coast (1.7km) This section of the Rhymney Trail lies to the eastern side of the Rhymney River mouth. The path leads from Wentloog Avenue to the foreshore an undeveloped piece of coastline with the wentloog Levels to the east. From Wentloog Avenue the trail follows the main path to the coast line. Link to Parc Tredelerch – From the start of the walk, on Wentloog Avenue, walk left towards the Lamby Way roundabout, keeping to the pavement on the left hand side of the road. At the roundabout crosses the two roads, towards Parc Tredelerch (taking great care due to the high volume and speed of traffic). When on Lamby Way walk 105 meters to point where there is access to the car park and picnic area. Once in Parc Tredelerch you can follow the Rhymney Trail north, or take one two other circular routes. 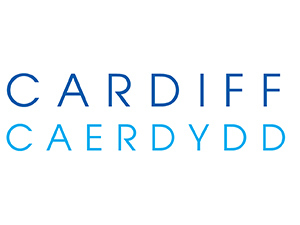 New Road Playing Fields – Parc Tredelerch (0.8kM) – The off road route through New Road Playing fields begins at New Road. In the Playing fields take a left and follow the Footpath around the edge. When the Footpath reaches Brachdy Lane, turn right and cross the footbridge over the railway into Parc Tredelerch. Take a left and walk 60m. Follow the path to the lake, cross the lake on the boardwalk, (the cycle route continues around the lake). After crossing the lake follow the footpath to the right, to a crossroads. Here there are two possible circular walks back to the entrance of Parc Tredelerch. 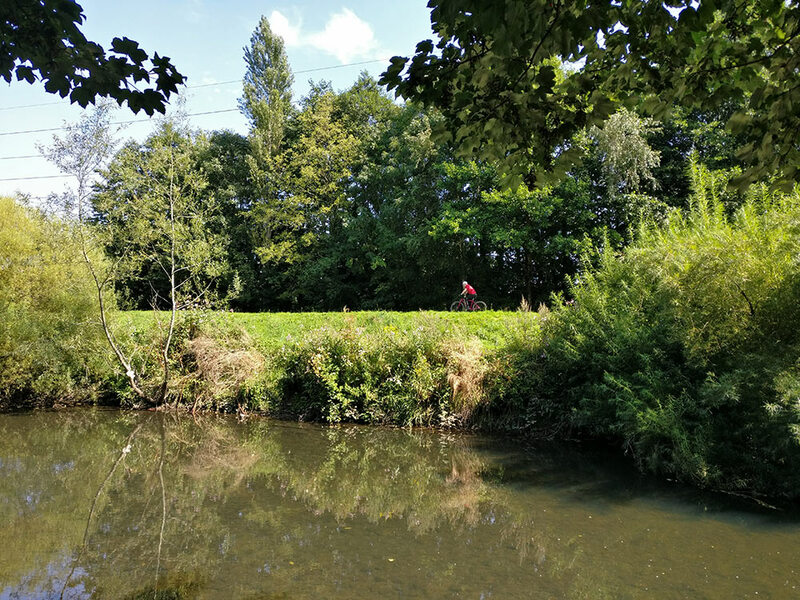 Circular walk 1 – Continue along the path that leads you round the edge of the lake (about 750 metres), keeping right when you come to a fork in the path. Circular Walk 2 – At the crossroads turn left, after 30 metres turn left again, back along the path to the entrance of Parc Tredelerch. There is also a circular walk in New Road playing fields. 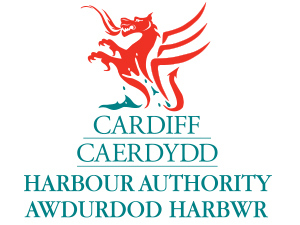 Link to Rumney Hill Gardens (0.7km) – From New Road playing fields, turn right along New Road, then left along Tredelerch Road for 60 metres. Follow the path through Catherine Gardens onto Ty Mawr Road and turn left. At Newport Road turn right to the pedestrian crossing. Cross and continue right for 70 metres, turning left into the entrance road to Rumney Hill Gardens. This section of the trail runs from Rumney Hill Gardens to Pontprennau underpass, and is open to walkers and cyclists. Other possible routes – From continue through the underpass to Pontprennau. If you cross Church Road there is a good off road walking/cycling route through the open space – about 1km, (this route is quite steep). Circular Route (see map 1) 3.6km – There is also a circular route, (signed with way markers) from Rumney Hill Gardens. Follow directions to Ball Lane. Instead of turning left over the footbridge, turn right along Ball Lane, at Llanrumney High School gates turn right onto Ball Road. After 30 metres, turn right into Hartland Road and follow this road until it becomes a path. Follow the path through Rumney Playing fields to the slope back up to Rumney Hill. This is quite steep. To avoid the slope the route can be started and completed at Ball Lane. The range of wildlife along the Trail is quite exceptional. Starting in the Wentloog Levels with its deep reens it’s common to spot Herons and birds associated with the Severn Estuary. The trail then passes by the lake at Tredelech Park and over Rumney Hill to the wide expanses of the Rhymney floodplain. 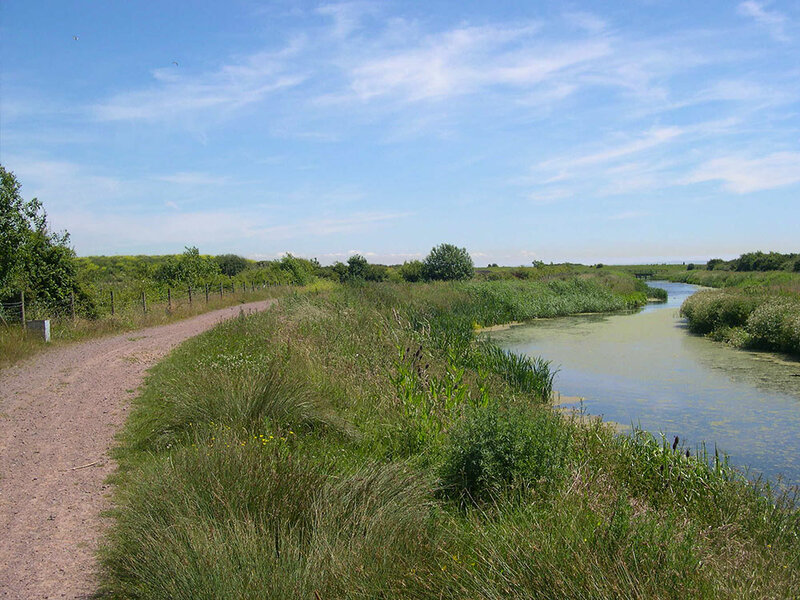 Reed beds, scrapes and marshes provide a great habitat for wildlife. The river itself is a valuable wildlife corridor. There is evidence of Roman activity in the lower reaches of the Rhymney Valley. However, the Rhymney does not possess such a legacy as the Taff from the industrial revolution. The Wentloog Levels area at the mouth of the river was man-made – reclaimed from the sea and protected by a sea wall. The Rhymney Trail starts on the sea wall right next to lowest trig point in Cardiff. 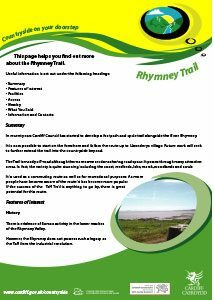 The Trail is easily accessed from the surrounding communities of Rumney and Llanrumney. Access points are also available from Llanederyn, Pentwyn and Llanederyn Village. 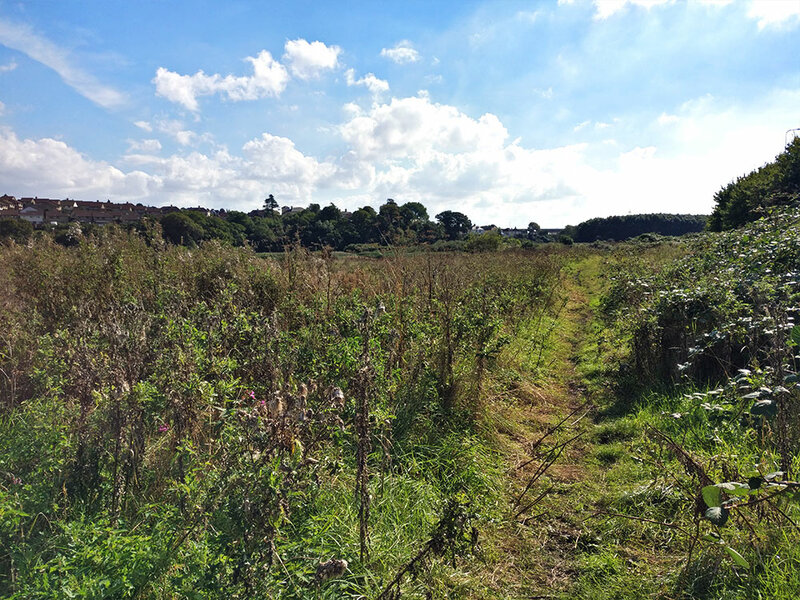 There are a number of locations within Rumney and Llanrumney to park within relatively easy distance of the Trail.